Broombridge is a station with a reputation. From the tales that came out of it during the 2000s, it seemed as if local youths were waging a guerilla war on public transport. Search for the station online, and you get horror stories on Boards.ie – arson, stone-throwing, trains not stopping on Garda advice. In the summer of 2004, pallets and a car door were used to block the line. Youths jeered stranded passengers while the driver cleared the obstruction, according to the Irish Times. That tale seems to have grown with the telling – one version I heard earlier this month described an entire car being pushed onto the railway line and burnt out. As far as I can tell, though, that never happened. So, maybe there is an element of legend to stories of the station. Still, in 2012, fed-up commuters organised a campaign to stuff an online poll being run by Irish Rail to pick the best railway station in the country. It didn’t quite work, but the point was made. 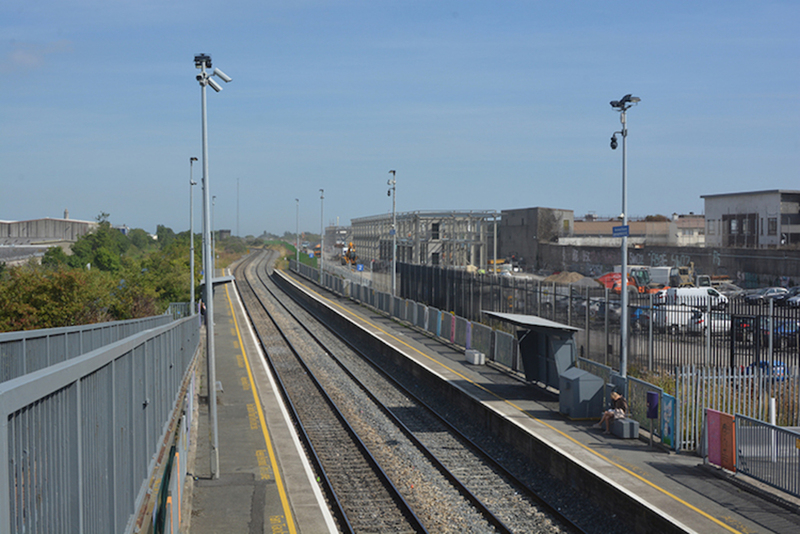 “In 2012, a station neglected while those around her have been modernised, she continues to crumble,” Donal Fallon wrote at the time on Come Here to Me. “Broombridge winning the ‘Best Station’ award would draw some attention to the sheer state of the place, and be the best coup for a public vote campaign since the BBC had to award the Wolfe Tones the best song of the last century,” he wrote. 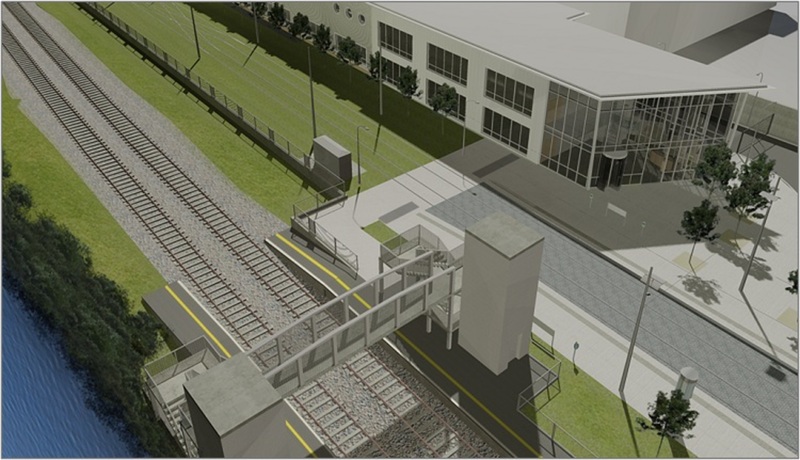 But with the new Luas line coming to Broombridge, things are changing – fast. Artist’s rendering of station after Luas arrives. Courtesy of Luas Cross City. If you’ve been anywhere near the city centre lately, you know about the new Luas line. The €368 million project is scheduled to open by November 2017. It will finally connect the Red and Green routes, and shoot a spur of badly needed rapid transit infrastructure up into the north-west of the city, following the old railway cutting from Broadstone to its terminus at the Irish Rail station at Broombridge. Before the rain came earlier in this week, tipper trucks working at the Luas depot site in Broombridge kicked up plumes of dust. They floated over the tracks, tan clouds fading the black stone of Broome Bridge. The legacy of antisocial behaviour is obvious in the station’s architecture. It’s a bare-bones operation: there are no staff, no ticket machines, and no real-time information screens. The only structures are a pair of steel shelters, painted warship grey. 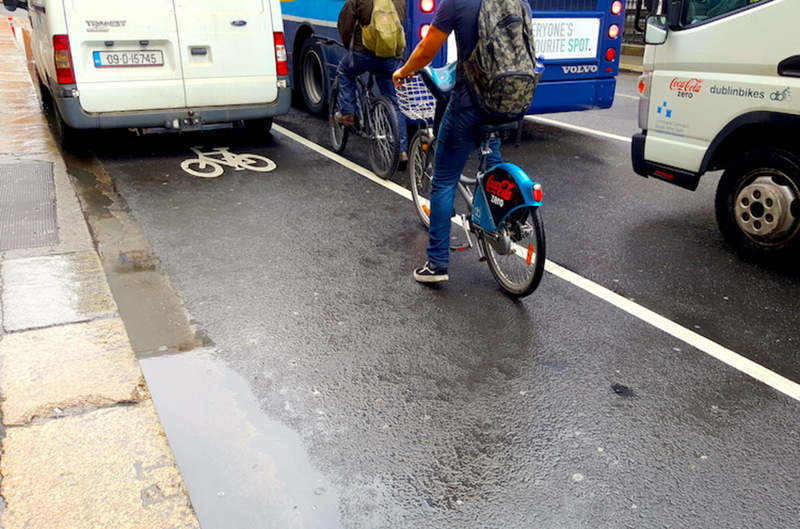 The tarmac under the one on the westbound platform, on the Cabra side, is covered in shallow craters where the melting plastic of burning bins has infused the black with blue and green. Two opened beer cans stood a comfortable distance apart on Platform 1, as though studiously ignoring each other. It had been raining all day, a straight-down drizzle that had filled the Royal Canal almost to the point of overflowing onto the towpath. Michael McDermott was the only person waiting at Platform 2, and definitely the only one sticking around. “The station itself is Fort Knox, nothing to it except concrete and steel and a bit of fencing and CCTV,” said the personal trainer, waiting to take a train west to Maynooth. McDermott has been in the area for three years now, living in the Royal Canal Park apartment complex. 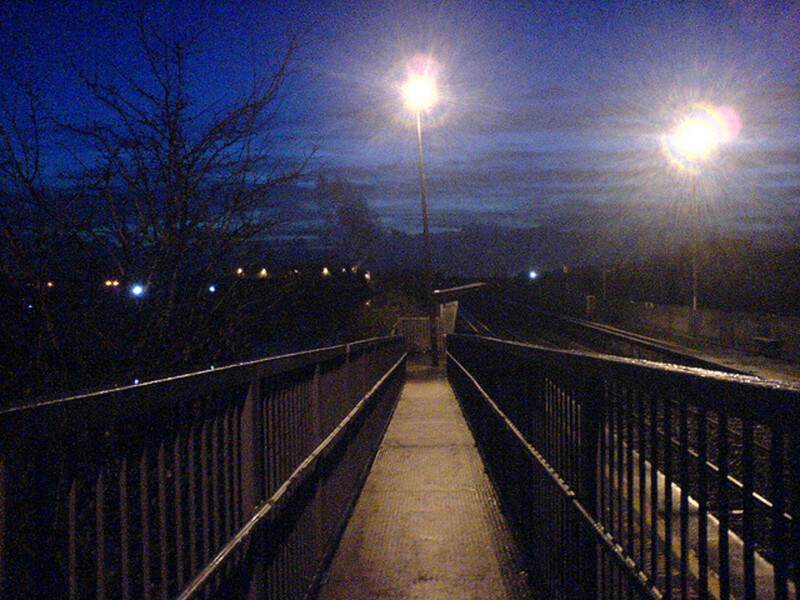 Theoretically part of Ashtown, it’s closer to the Broombridge station. So, every time he has a train to catch, he follows the towpath down the back of the Dublin Industrial Estate to Broombridge. “The swans do go for ya the odd time,” he said. The station can be a lonely and forbidding place, which might explain why none of the commuters I saw getting off trains there this week were female. Michael says he doesn’t get much trouble though. Photo from 2007 by Jaqlan, used under a Creative Commons licence. A gout of water from a hole in the steel shelter roof hits McDermott on the wrist as he speaks. Irish Rail did some upgrade works recently to improve things here. There are two Leap Card validators on poles at the entrance, but they’re not the usual sort. While moulded purple plastic does the trick one stop down the line, these are armoured in steel tubes with perspex windows. McDermott has been around long enough to remember what travel was like before those validators were installed. It was impossible to buy a ticket or scan a card at the station, so commuters had to argue their case to the inspectors at Connolly when they met the turnstiles, he says. Mary Fitzpatrick is a Cabra native and the local area representative for Fianna Fáil. She says the location of the station makes trouble inevitable. “In terms of vandalism and antisocial behaviour, I think that was caused by the desolation of the place. It is, I suppose, quite deserted, because it’s on the edge of Cabra in the sense that the nearest road is Bannow Road,” she said. “Historically there you had the Bachelors factory, you had Dublin City Council waterworks. It wasn’t residential, the land by the station, and then the other side of the land you had kind of a bit of wasteland and then the Dublin industrial estate,” she said. Unlike Ashtown, the next station west along the line, Broombridge is surrounded by industrial units, some vacant, others derelict, and none with residents overnight to keep an eye on things. “Nobody likes to use a place that feels abandoned or deserted, and I suppose it did feel like that for quite a while. The other stations you see along the line have been upgraded,” Fitzpatrick said. The working industrial units nearest the station are well fortified, with towering walls and double rows of razor wire. Further west, the dereliction sets in at the back of the Dublin Industrial Estate. Through a gap in the fence by the towpath west of the station, a concrete yard contains the ashes of a large, acrid bonfire. Wire hoops from burnt tyres litter the ground and threaten your shins. 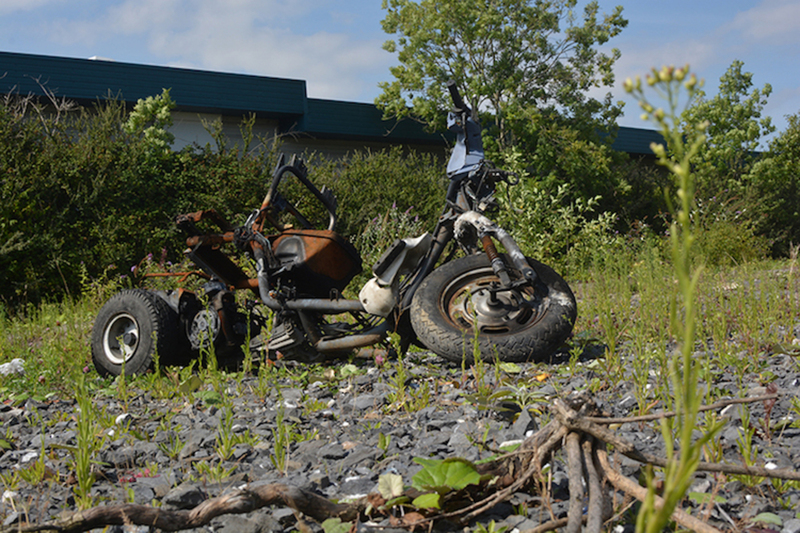 A burnt-out scrambler bike rests among the weeds. “That is where the trouble is, that field,” said Jay Farrant. Farrant manages the ABS Gym in the Tolka Valley Industrial Estate, the part of the business park on the west side of the Broombridge Road. The gym seems to be the only thing open in the units backing onto the canal here. The evangelical church next door is locked up, and the rest of the nearby units are empty or derelict. Farrant is a beefy Welshman who came to Ireland as a personal trainer in time to catch the last of an industry boom towards the end of the “tiger boom or whatever they called it”. He’s not worried about safety – he lives locally and leaves his front door unlocked. He can also bench press 160 kg, so that might have something to do with it. A few nights ago, a car was broken into beside the patch of waste ground next door. Green safety glass was scattered in two strips – one for each side of the car. “One of our girls stupidly left her car there. It’s her own fault,” Farrant said. He doesn’t have an opinion on where the troublemakers are from. It doesn’t matter. “It’s like … kids will be kids. It happens everywhere,” he said. The business parks around Broombridge might be run-down, but the low rent makes certain business models viable. Four years ago, Farrant’s boss bought a previous gym on the site out of liquidation. 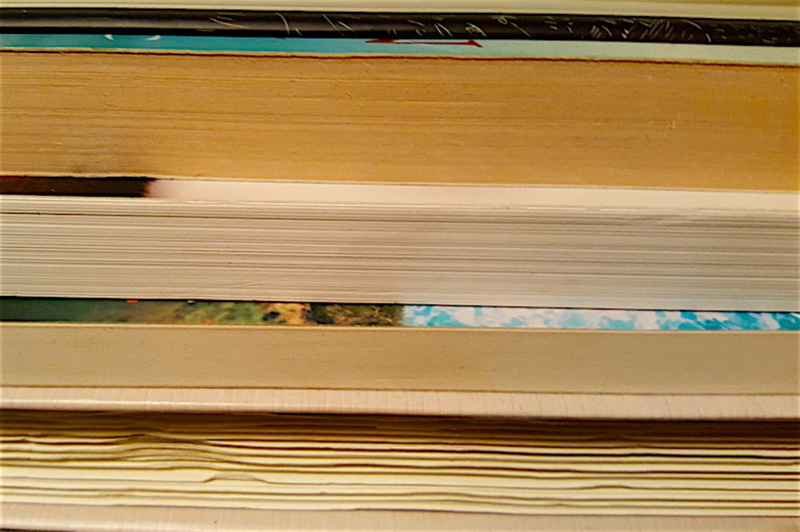 “I’d say say the marketing slash the area [was wrong] – they were going for a higher market. It didn’t do well,” he says. ABS Gym targets its personal training programmes towards the local market – people who maybe don’t have the spare cash for a new car or a holiday, but who want to get into good shape without spending too much money, he says. It’s clearly a winning pitch. “There’s a shitload of gyms around here. I can think of six but there’s probably more. It’s really weird. I think that’s something to do with the economy,” Farrant says. The area was originally zoned for light-industrial use, but over the years showrooms and gyms have replaced older businesses, says Ronan Lyons, assistant professor of economics at Trinity. Lyons believes more could be done with this little finger of Glasnevin, and other underused, less-densely developed areas in the city. 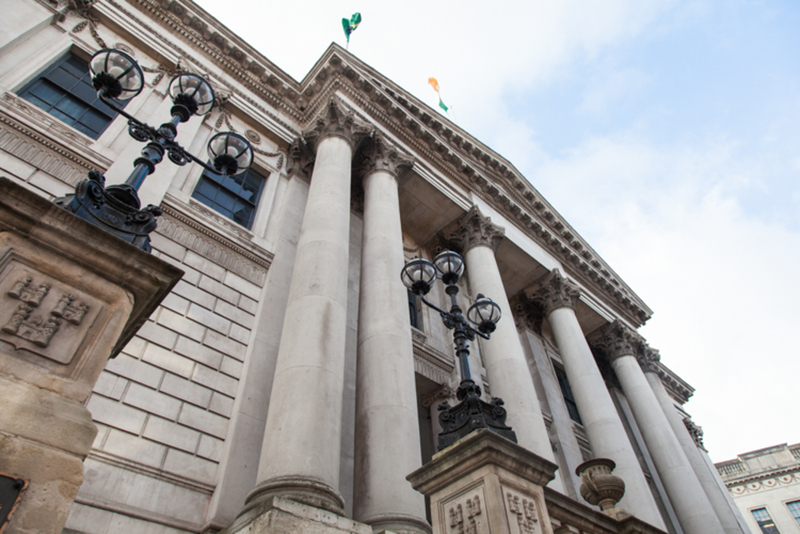 With the current shortage of housing in Dublin, he says planners need to take a hard look at the way land is used in the city – and he believes a new system of land tax would be key. Lyons favours a tax on commercial land use across the board – he believes accountants and lawyers will run rings around the levy on vacant land when it comes into force in 2018, and so it will have little effect. But a blanket tax would have have more impact, he says. When Lyons set out to present his argument for an across-the-board commercial land tax at the MacGill Summer School two years ago, he used Broombridge as a case study. “A good land tax would get land used well, and I thought a very good example of this was the Dublin Industrial Estate at Broombridge, particularly because the Luas is terminating there. It seems to me crazy that all this investment would go to connect the Luas effectively to an area where very few people live or work,” Lyons said. Lyons says the current planning regime is inflexible and does too much to preserve the status quo – at the cost of jobs and affordability. “If you introduce a land tax, what you probably will have is a large firm buying it up trying to redevelop it – but as they do that they will be paying taxes based off the high value to the council and that will help pay for the amenities that go in,” he says. Ultimately, Lyons says it’s about value for money. Ronan Lyons isn’t alone in seeing opportunity at Broombridge. Dublin Institute of Technology snapped up a former warehouse west of the Broombridge Road in 2011 for €2.75 million, a few years ago. Commercial property was cheap, and college officials saw a bargain. “It originally started out as a large refrigerated stores. Then it became a recycling plant, and afterwards sat unused, disused for a number of years until DIT bought it,” said Paul Moran, DIT’s head of planning. The plan to was to put sports pitches and changing rooms there. While the site lay waiting for funding between 2012 and 2014, it was hit by scrap-metal thieves who stripped copper wiring from the vacant building. Moran, said all vacant buildings have issues with copper theft, and that DIT’s site in Broombridge was no different. “Certainly the station had a reputation, [but] it was down to a small number of operatives,” he said. Initial leeriness from the student body over the price of the job turned to anger as the project came to be seen by some as a boondoggle. Costs ballooned from an estimate of under €4 million to over €8 million, requiring a bailout from the student-controlled campus-life fund. But college officials pressed ahead, and training sessions are set to kick off there in time for the new academic year. “The pitch itself is done, and the adjacent changing rooms are just being worked out at the moment – they should be ready in a couple of weeks’ time,” Moran said. He still thinks it was a good buy. “In the area, if you look at it, there are very few other sites of that scale, and with the plans to bring the Luas there, we saw an opportunity to solve a long-term problem. “On the Grangegorman site – beautiful and extensive as it is – the master plan was giving us three pitches, which was very welcome, but in comparison to the amount of sporting activity which goes on [isn’t enough]. “So the plan is to deliver an additional all-weather playing surface that can be used primarily for training. The grass pitches [in Grangegorman] will be primarily for matches, where you can have an audience,” Moran said. Cabra is fairly well served for sports facilities, but the demand for sports pitches in the area is endless, according to Mary Fitzpatrick. Moran says the sports staff at DIT are actively seeking out local clubs and groups who might use the new pitches during quiet periods – paying in, of course. “Obviously [DIT] students have paid for it so they’ll have first dibs, but during the day there’ll be a chance for local groups to use the facilities,” he said. If DIT manages to scrape together more money for Broombridge, the warehouses on the site will be converted to house indoor sporting facilities – the college is is currently asking its sports clubs for their wish lists, he said. Moran said DIT was not currently planning to develop student accommodation near Broombridge, and that its focus was on Grangegorman for now. When the decision was first taken to bring the Luas to Broombridge, transport officials took a fresh interest in dealing with their problem station. Mary Fitzpatrick and other community representatives met with the company “three or four years ago”. But Broombridge’s time had come. “The other development which has taken place along the line, Ashtown, Pelletstown – that has created extra traffic as well, so I suppose it’s just a coming-together of a number of factors,” Fitzpatrick said. Since the decision was made to bring the Luas Cross City, to Broombridge, Irish Rail have become much more involved with the local community, she said. They’ve engaged with the youth service, the policing forum, and with community groups, she said. They’ve tried to listen to local residents’ concerns, and then team up with them to improve the station. 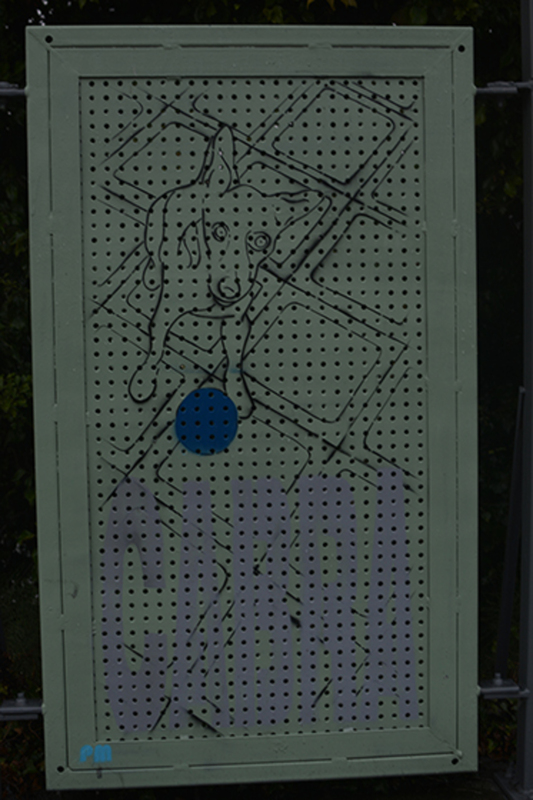 The new art is sanctioned graffiti – nothing as bold as the “ED5K” tag by the rails under the main Broombridge arch, but just as vibrant on the standard grey platform fencing. Uncontroversial bits of pep talk address the morale of commuters: “You’re never more than 5 days till the weekend”, and, as edgy as it gets, “Don’t judge a station by its name”. “I think people are looking forward to the creation of this stop,” said Gráinne Mackin, communications director at Luas Cross City. “I think this is going to be a positive for the area, it’s going to bring more people there, you’re going to have a higher footfall with the Luas stop there you’ll have a service every eight to ten minutes so you’re going to have much more vibrancy around the area,” she said. And the arrival of the Luas will mean more security, Mackin said. All Luas stops and trams have cameras, and the trams have on-board security. “The management of the cameras and the ongoing patrols we have on the Red and Green lines in terms of anti-social behaviour and fare evasion will be part and parcel of the operations out in Broombridge,” she said. Although Irish Rail did not to supply statistics, when asked, on problems at Broombridge station over the years, such as vandalism and stone throwing in recent years, they say their new approach is having an effect. This is a very good article. Did IR say if they would be spending any money redeveloping the mainline station before, or as, the new tram depot opens? I see a pedestrian overbridge in the images, but that looks like all they’re committing to.. Seems a like wasted opportunity given the new dawn the tram will bring to Broomer.